Today the Nest community received notice from CEO Tony Fadell that the Nest Wave feature (that cancels alarms by detecting a wave under the device) is being disabled in all devices after tests revealed a movement under the detector could inadvertently cancel the alarm in the event of a real fire. a) All customers now need to get their device onto a WiFi network to be updated. b) They need to halt the sale of all devices that they and distributors/retailers have in stock so that the packaging can be opened and the devices are updated BEFORE they are repackaged and sold. c) The Nest brand is likely to suffer some damage particularly as the marketing effort for Protect was really focused on providing reassurance and gaining customer trust. d) Some customers will take them up on the 100% refund offer which could be a big financial hit on the firm as they’ll be refunding at RRP not what the amount they were paid by the Apple stores (note a problem similar to this cost the much smaller US senior mobile brand Jitterbug/GreatCall a figure I calculated at the time to be somewhere north of $24 million). With an embedded solution (similar to that featured within the Kindle from Amazon and Telcare’s revolutionary Glucometer) none of these issues would be a problem as the devices could just be updated over the air and the apps on the customers smartphones could be updated to inform them that this update has been made and why. With companies like Cubic Telecom creating disruptive global connectivity options for OEMs (and already working with Google on the embedded connectivity for their new ChromeBook laptop) I don’t think it’s going to be long before the accountants deciding on connectivity options for mHealth devices will realise the small extra expense involved with adding mobile network connectivity will pay for itself in improved customer experience (eg. like FireText’s mobile connected smoke alarm it would be capable of working anywhere that is covered by a mobile network) and future proofing (with it’s own connectivity the device could be updated as and when). 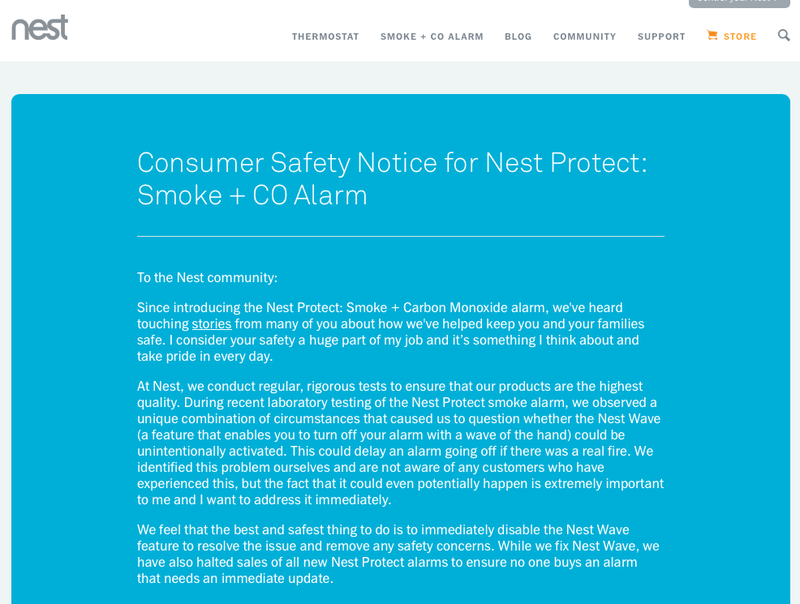 Gigaom has reported (HatTip @DrDave01) that a Consumer Product Safety Commission recall has revealed that Nest sold more than 440,000 smoke/CO alarms. If customers take them up on the 100% refund offer this could end up costing Nest more than £40 Million.